Chaco sandals are great for active people who love the outdoors or anyone who enjoys a supportive, adjustable and comfortable sandal. But when grime and odor eventually accumulate in your favorite sandals, you'll need to refresh them and get them back on the road quickly. Machine washing or hand cleaning, depending on your particular Chaco model, is the way to go, and you can also make the sandals easier to adjust and wear by cleaning them thoroughly. Wash Chaco sandals with non-leather straps in the washing machine for the quickest, easiest cleaning. Put the sandals in the washer with a load of dark clothes, such as jeans. Do not wash them with bleach. Wipe down Chaco sandals with leather straps with a soft, damp cloth; do not machine wash them. Allow the sandals to air dry. Avoid direct or intense heat, which may damage the sandals. Use the scrub brush and a mixture of baking soda and water if you prefer to clean your sandals by hand. If the insoles have dirt caked into their grooves, detailing your Chaco sandals by hand may be a better solution than machine washing. Clean the channels that contain the straps every few times you wash your sandals by sliding the straps through the shoes repeatedly. This motion will loosen and remove dirt and grit to keep the straps moving smoothly. Lubricate the movement of the adjustable Chaco straps by pouring a small amount of Armor-All diluted with water into the strap holes. The Armor-All will make it easier to adjust your straps on the fly. Use a leather conditioner to prolong the life and improve the looks of leather straps on your Chacos. 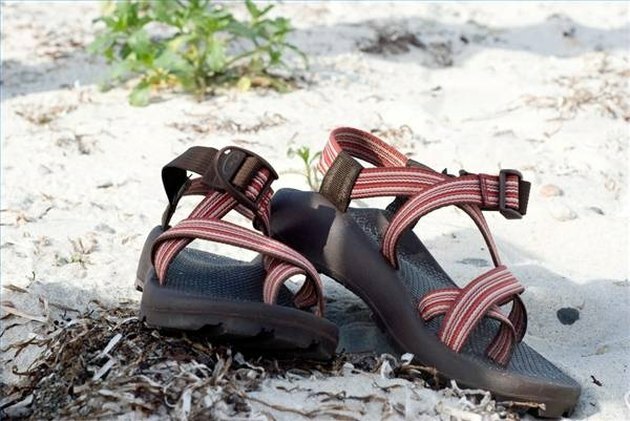 The Chaco company warns that the conditioner may darken the color of the straps, however, so be ready for a change in their appearance if you use this kind of product on the sandals. Chacos can be resoled, and the webbing of the straps can also be replaced. The models that can be remade in this way include Chaco Z/1, Z/2, ZX/1 and ZX/2 sandals. You can find out more about these options at the repair section of the Chacos Web site (in the Resources).